Welcome to language-easy.org! Well, as you have clicked on this article, I think that you are ready to enter the depths of German sentences, and dedicate yourself to this special kind of subordinate clauses. So, German indirect questions can be difficult sometimes. Because of changes in word order and other elements. Nevertheless, it is an important German dependent clause – but for sure you know that – as they are quite similar in their usage to indirect questions in the English language. In the following, I’d like to talk to you about the difference of word order in German indirect question. After that, we will have a look at a special kind of German indirect questions – where the word “ob” is used. Finally, we will also examine the punctuation in German indirect questions. By the way, in case you’d like to more about German indirect questions, just click in this article on Wikipedia. Hopefully, it will provide you with all the background information about German indirect question you need. 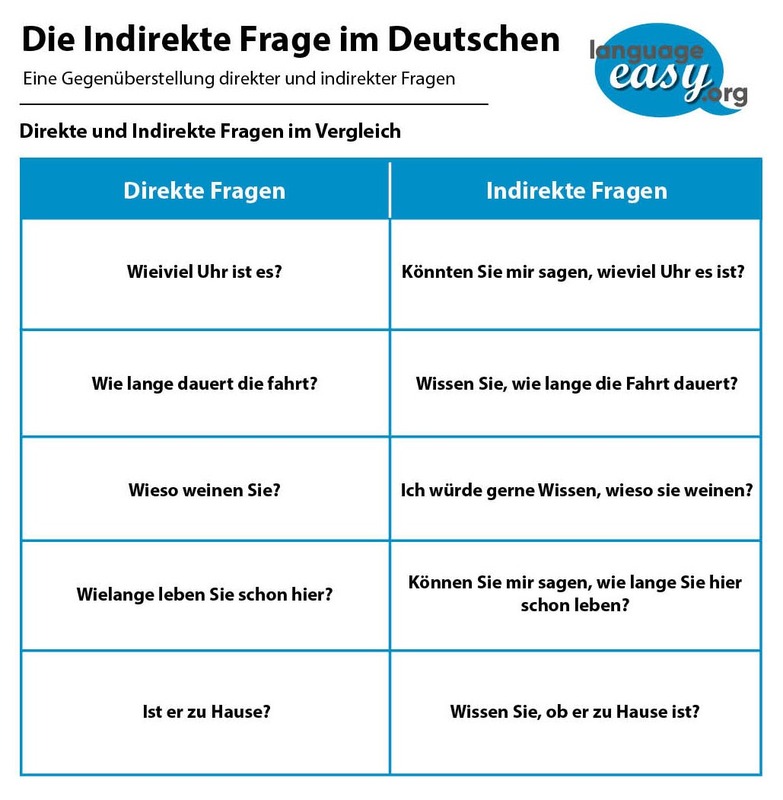 And now, let’s not lose too much time and come straight to the first part of this article and talk about the word order in German indirect questions. Auf geht’s! Well, let’s have a look at the first part of this article, the word order of German indirect question. But first, let’s clear up what German indirect questions actually are! So, please keep in mind the following description of this term. Indirect questions are questions that are included within the structure of another sentence. So, as German indirect questions are subordinate clauses, we have to change the position of the finite verb in the dependent sentence. Well, of course, this differs from the word order of ‘normal’ German questions. Luckily, there is the following rule for the word order in German indirect questions. Well, here are some examples that illustrate what I mean by this rule for the word order. By the way, I’d like to give you a short list of the most common question words used in German. Of course, you have to decline them depending on the context. Of course, there are many more introduction words for the German indirect questions. Well, just try to learn you vocabulary and keep in mind the introduction words mentioned in conversations in German. Now, let’s come to the next topic if this article and talk about the German indirect question with the word “ob”. Well, in this short part I just wanted to mention, that the conjunction ‘ob’ can be quite useful. So, in case that there is no question word, you can simply use “ob” to introduce the indirect question. With ‘ob’ we transform yes / no questions in a indirect question. And now, let’s come to the last point and talk about the punctuation in German indirect questions. Finally, we still have to clear up everything about the punctuation used in German indirect questions. Well, usually, they end with a full stop and not with a question mark. Of course, a question mark is only used when the indirect question is an actual question.